We reprint below a leaflet issued by the Bay Area Spartacist League on October 14 and distributed at the October 17 Antiwar Coalition’s rally. Socialist Action leader Jeff Mackler has been caught red-handed at a game he has long been playing in his self-described role as “a national antiwar leader for the past 45 years.” That is, his service as a running dog for the trade-union bureaucracy and, behind it, the often-preferred party of imperialist war in the U.S., the Democrats. An article by quirky rad-lib journalist Alexander Cockburn (CounterPunch, 4-6 September) exposes Mackler, in his capacity as a leader of the October 17 Antiwar Coalition, as the moving force in canceling an antiwar picket against Democratic Party House Speaker Nancy Pelosi at a $100-a-plate breakfast in a ritzy hotel in San Francisco on Labor Day weekend. Cockburn recounts Mackler’s apoplexy when he learned that this protest, which the October 17 Coalition had voted to endorse, was taking place at an event hosted by the San Francisco Labor Council. In an e-mail to his fellow coalition leaders, Mackler raved: “No one knew that we voted to hold a demonstration at the Labor Council breakfast!” (Evidently they had been hoodwinked by Steve Zeltzer, a perennial gadfly in the Bay Area liberal-reformist swamp, who put forward the motion.) Declaring that a “time bomb was ticking,” Mackler argued that this was a “grave mistake that needed immediate correction” or else the coalition would lose “the ability to ask in good faith for Labor Council support” for their October 17 antiwar protest in San Francisco. According to Mackler, his umbrage at not being informed that Pelosi was being hosted by the trade-union tops was shared by others in the coalition, including the Revolutionary Communist Party’s World Can’t Wait front group, Workers World’s International Action Center and United for Peace and Justice. But the day was saved for these antiwar reformists, not to mention Pelosi and her labor statesmen hosts. Labor Council chief Tim Paulson wrote: “Our partners in the anti-war movement have been calling me to say they are condemning this protest as irresponsible and divisive.” Paulson particularly pointed to the Party for Socialism and Liberation’s ANSWER coalition as well as U.S. Labor Against the War. Having more of an inside track into the whole affair is Socialist Organizer, which has endorsed the October 17 demonstration and whose leader Alan Benjamin serves on the executive committee of the Labor Council. 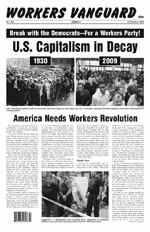 In response to Cockburn, a lengthy article in Socialist Action (October 2009) is headlined: “Red-baiting against Socialist Action & the antiwar movement—Mackler replies to Cockburn’s smears.” Far from red-baiting, Cockburn’s article in fact makes the opposite charge, i.e., that Mackler and his fellow “antiwar” leaders have about as much to do with revolutionary politics as HMOs have to do with health care (or, as Cockburn puts it, these recent antics only demonstrate that Mackler is “longer of tooth, but no closer to socialism”). Indeed, here in the very small petri dish of the October 17 Coalition, we see the role the reformist left plays in the syphilitic chain that has shackled the working class—the one force in this society with the social power and historic interest to wage a genuine struggle against the barbaric wars and occupations of U.S. imperialism—to the capitalist class enemy. The reformists serve the labor bureaucrats who in turn serve to subordinate the unions to the parties of imperialist war, particularly the Democrats. Others do the same under the cover of more “revolutionary” rhetoric. Take the Internationalist Group (IG), for example. They promote the May Day 2008 antiwar port shutdown by the International Longshore and Warehouse Union (ILWU) as opposed to the opportunists’ “program of chaining the working class and antiwar activists to the Democrats.” The May Day action, which shut down ports up and down the West Coast, was a powerful demonstration of the kind of working-class action that is needed against the imperialist occupations of Iraq and Afghanistan. But it was politically undermined by the ILWU bureaucracy. Seeing the opportunity to make a statement of the union’s strength in the midst of the 2008 contract negotiations, the ILWU tops simultaneously channeled the anger of the ranks against the Iraq war and desire to defend their union into “national unity” patriotism and support for Obama for Commander-in-Chief of U.S. imperialism. The IG claims this was all the doing of the ILWU International tops as opposed to their man in the bureaucracy, left-talking ILWU Local 10 Exec Board member Jack Heyman, who authored the motion calling for the port shutdown. Heyman in turn decries our statement that the protest was “against the occupation of Iraq (but not Afghanistan, the preferred war of the Democrats)” as an outrageous falsehood. In fact, the length of the efforts to deep-six any mention of Afghanistan, not to mention Pelosi, was confirmed by antiwar activist Cindy Sheehan, who was a featured speaker at the SF May Day rally held in conjunction with the port shutdown. Sheehan, who at the time was running as an independent against Pelosi, told Workers Vanguard that Clarence Thomas, who was then an ILWU Local 10 Exec Board member (and Heyman’s co-emcee at the rally), “really shocked me and said that I couldn’t say anything bad about Nancy Pelosi or talk about Afghanistan; I was supposed to stay focused only on Iraq”! This attempted censorship wasn’t perpetrated by the ILWU International tops but by one of the “progressives” of the Local 10 bureaucracy. Indeed, the very purpose of double-talkers like Thomas and Heyman is to give a “militant” gloss to the class-collaborationist treachery of the ILWU bureaucracy, of which they are an integral part. Here the IG covered for Heyman who covered for the ILWU International, whose “loyal to America” patriotism on May Day was designed to boost the Democratic Party, which, now in power, is intensifying U.S. imperialism’s assault on the peoples of Afghanistan, expanding it to Pakistan and waving its sabers against Iran. Breathing a sigh of relief that the October 17 Coalition had managed to remove its “good name” from the protest against Pelosi, Mackler sanctimoniously intoned that labor support was particularly critical “in these days of terrible encroachments on the lives, health and stability of working people, not to mention the masses who are daily slaughtered in the course of the U.S. wars that we so strongly oppose.” Cockburn aptly replied: “Opposition to the war and the slaughter of the masses apparently stops and flees at the hideous possibility of causing embarrassment to the San Francisco Labor Council.” But then again, Cockburn himself knows a thing or two about fleeing from opposition to war. In the lead-up to the 1991 imperialist onslaught against Iraq, Cockburn wagged his finger at those leftists calling for “U.S. Out of the Persian Gulf!” Instead, he argued for “the conversion of the forces confronting Iraq in the region into a genuinely multilateral force—with diminished U.S. presence—under a genuine U.N. command” (Nation, 8 October 1990). At the time, Cockburn and Mackler’s Socialist Action stood together in endorsing an antiwar coalition that promoted UN sanctions against Iraq, which were the prelude to the 1991 war and which continued after it, costing the lives of over one million Iraqis. So Cockburn has something of an inside view in presenting some of the details of Mackler’s long and sordid history of subservience to the labor tops in a variety of “antiwar” and other coalitions. In particular, Cockburn points to Socialist Action’s adamant opposition to including any call for “No US Intervention in the Middle East” or in defense of the Palestinians when it played a leading role in the 1980s pro-Democratic Party coalitions protesting U.S. intervention in Central America and in opposition to apartheid South Africa. In his lengthy reply to Cockburn, Mackler indulges in much pompous windbaggery about what it takes to “build a united-front-type, democratic, and effective antiwar movement.” With this as his alibi, he essentially pleads guilty to all charges. Mackler concedes that Socialist Action’s opposition to the inclusion of a “demand on Palestine” at the time of the Israeli occupation of Lebanon and the first Palestinian intifada was indeed motivated by concern that “labor would walk,” i.e., that it would offend the labor bureaucrats who toe the line of the rabid pro-Zionism of the Democratic Party. Now, he pontificates that if the October 17 Antiwar Coalition had “pressed forward” with the protest against Pelosi “we would have also risked the formal support of the S.F. Labor Council” (which subsequently was secured). Opining that “labor’s political break with the class enemy is not on the agenda today,” Mackler declares that it is “eminently more reasonable to approach the organized labor movement patiently and with due care.” This is all a long way of saying that selling out to the trade-union bureaucracy and the Democratic Party is what “building the movement” is all about. And Mackler is a practiced hand. Mackler contests Cockburn’s charge that Socialist Action tried to bully a woman of Lebanese descent to prevent her from raising the defense of the Palestinians at a 1980s coalition meeting in a packed union hall. We don’t know about that. But we can testify that thuggery has long been wielded by Mackler and much of the reformist left to silence any opponents of their grotesque class collaborationism. During the Vietnam War, when he was a member of the ex-Trotskyist Socialist Workers Party (SWP), Mackler was a leader of the National Peace Action Coalition (NPAC). While the best of the youth radicalized by the struggle against the Vietnam War stood for the military victory of the National Liberation Front/Democratic Republic of Vietnam, NPAC was busy sealing an alliance with the defeatist wing of the American bourgeoisie, which sought to cut U.S. imperialism’s losses in its dirty, losing war in Indochina. This alliance was sealed with the blood of leftists. At a July 1971 NPAC conference, SWP goons viciously attacked members of the Spartacist League and Progressive Labor-SDS who protested against Democratic Party Senator Vance Hartke, a keynote speaker at that conference (where he appeared side by side with “progressive” labor bureaucrat Victor Reuther). After emerging from the SWP in the early 1980s, one of Socialist Action’s first political acts was to serve as goons for the SF labor bureaucrats at a solidarity rally with the 1983 Greyhound strike. After listening to over an hour of empty speeches by the bureaucrats, a couple of thousand militant workers took to the streets and headed to the Greyhound terminal, where they stopped scab buses from running. At a rally a week later, when militant workers again defied the sellout bureaucrats and set up picket lines at the terminal, they were met with a line of bureaucrats and “socialist” goons, including Mackler. We happily plead guilty to having played a role in militant labor action when workers picked up our chants of “Picket lines mean don’t cross!” as they surged toward the Greyhound terminal. Out of such struggles we seek to arm the working class with a conscious understanding of its social power and historic interest to wage a political confrontation with the capitalist class enemy. Mackler’s role as a goon against class struggle was, at the time, matched in Socialist Action’s avid promotion of the CIA-bankrolled “union” in Poland, Solidarność, whose aim was the counterrevolutionary overthrow of the gains of the Polish deformed workers state. This social-patriotic call has long been a central rallying cry of the so-called “antiwar movement.” But while the sons and daughters of the working class are used as cannon fodder for the military adventures of U.S. imperialism, these aren’t our troops. They are the armed forces for the bloody wars and occupations of U.S. imperialism abroad and the violent suppression of the working class, blacks, immigrants and all of the oppressed “at home.” The side of the working class and all genuine opponents of U.S. imperialism is in defense of the peoples of Iraq, Afghanistan and Pakistan against the occupiers and their allies and for class struggle against the capitalist rulers at home. Mackler proclaims that the purpose of the October 17 Antiwar Coalition is to build “a massive and successful challenge to the ongoing and expanding U.S. imperialist wars in Afghanistan, Iraq, and Pakistan....” In fact, the opposite is true. Far from fighting war, their kowtowing to the labor bureaucracy and the Democratic Party actually promotes war, because it cements the ties that bind the working class to the continued rule of U.S. imperialism. The only program to end war is the revolutionary struggle to get rid of this decaying system. Imperialist war is the necessary outgrowth of the drive between competing capitalist powers to increase their profits through capturing foreign markets and raw materials around the globe. Our purpose is to build a workers party to give a conscious class-struggle leadership to struggles against U.S. imperialism and its bloody depredations against the peoples of the world and the working class and oppressed at home. Grounded in a program of revolutionary internationalism, such a party will fight not only for the immediate interests of the working class but also for its liberation, and the emancipation of all of humanity, from capitalist class rule, by bringing to power the socialist rule of the multiracial proletariat.